Clouds and drizzles will slow down by Friday evening. Don your trench coat, grab your umbrella and check out Georgetown's French Market. It'll be warm Saturday, so put on the summer outfit you've been saving, ignore any sprinkles and enjoy Broccoli City or a food festival. Sunday's your sunny day — but temps will stay in the 50s. Sweater up for Frulingsfest's pig roast or National Harbor's Food and Wine Fest. Whether you're in the mood for chocolate, beer, croissants or a pig roast, you're covered this weekend — we're pretty sure it's impossible to hit every food fest happening. That's on top of Broccoli City, which isn't so much a place to eat endless leafy greens but a chance to catch Cardi B, Miguel and Migos at D.C.'s homegrown, innovative music festival. Migos, Cardi B and Miguel are slated to take the stage at D.C.'s signature music festival. If you missed out on the 5K, conference and other activities, just keep an eye out for next year's festival. It keeps getting bigger and better every year. Cardi B announced on Twitter that Broccoli City will be her last performance for awhile because of her pregnancy. So if you're a fan, here's your chance! Canadian producer Ryan Hemsworth will have U Street Music Hall moving on Friday. If you're over 21, the show is free before 11 p.m. (but expect a line). A ticket will cost you $10. The classically trained musicians of Electric Fantasy will strum out their favorite classic rock songs their electric violins, guitars, keyboards and basses. The Wu Tang Clan-inspired group blends jazz, hip-hop and rap for a powerful performance. Plus, it's free! Tickets for this all-night afrobeats show start at $20. Celebrate Independent Bookstore Day by scoping out a local bookstore near your neighborhood. The organizers have put together this handy map. Questlove just released the book "Creative Quest." Grab a ticket to the talk for a copy of the book and a chance to get it signed. NeNe Leakes, Loni Love, Sherri Shepherd, Hope Flood, Melanie Comarcho and Sam Jaw are performing. Tickets start at $40. Artists, music and dance will take over downtown Takoma at this festival, which also features free yoga, a bounce house, demonstrations and studio tours. Head to the 1200 block of Florida Avenue NE for an outdoor celebration of art and music. Elevate your chocolate experience with tastings and talks focused on all things cacao. Tickets start at $30. It's like Oktoberfest but in the spring. Head over on Saturday for drinking games at the Bavarian Olympics (3 p.m.) or on Sunday for a pig roast (3 p.m.). Skip breakfast and come hungry for all-you-care-for sips and snacks. Tickets start at $39, which seems like an amazing deal considering rose, wine, beer and other adult beverages are included. Twenty restaurants are signed up to offer tapas-sized tastes along 8th Street. One ticket gets you one small plate. You can buy tickets online; it costs $5 for a single ticket or $20 for five tickets. Dozens of local food vendors will offer up unlimited bites. Tickets are $75 and benefit the Washington Jesuit Academy, a school for boys from underserved communities. Lunches go for $18 and dinners cost $34 at several downtown Bethesda eateries. 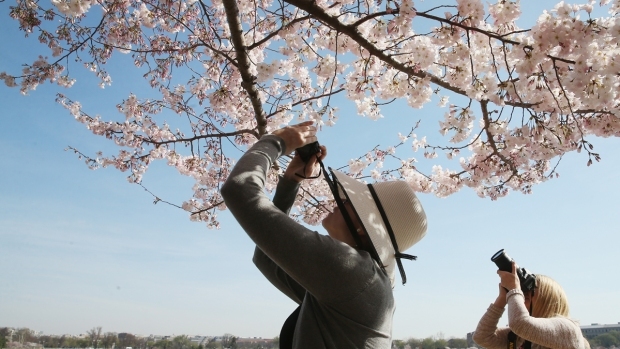 Your last chance to catch this year's Cherry Blossom Pop Up Bar is on Sunday. Doors close at 12:30 a.m. Munch on croissants and macarons while pursuing shops. You'll also find live music, a French-themed photo booth and street performers. A dog costume contest, talent show and an owner-pup lookalike contest will keep you entertained while your furry friend can enjoy an agility course, play area and fashion show. Adult tickets are $10. Safely dispose of unused prescription drugs at a DEA-approved location. Find them here.. The iconic carousel is opening for its 98th season. The Hispanic Heritage Foundation and Telemundo 44 have partnered to create the Latinos on Fast Track Coder summit, featuring networking opportunities, workshops and more. Special tickets are required for this weekend's series against the Arizona Diamondbacks. They're still in it! The Capital's second game against the Pittsburgh Penguins is scheduled for Sunday as the team keeps fighting for the Stanley Cup. Tickets are still available as of this writing, starting at $80. The Wizards continue their series against the Tornto Raptors in the playoffs. Tickets (as of publication) start at $29.